Contrary to the perception of ride/car sharing services potentially eliminating the need for a vehicle, nearly all of Gen Z want to own a car (92%). Even though Gen Z has a high level of comfort with purchasing online, they want to keep in-person interactions as part of the car-buying experience. The test drive is very important to Gen Z, and the majority of them want to test drive a vehicle more than once before making a purchase. In order to understand this generation’s view on automotive, Autotrader and Kelly Blue Book conducted a multi-phase study on nearly 1,200 Gen Z teens aged 12 to 17. Because we wanted to be able to compare this generation to other generations, we also spoke to Millennials, X’ers and Boomers. We had them complete a 20-minute online survey and 3 online chat sessions, and then followed up with a 10-minute online survey. 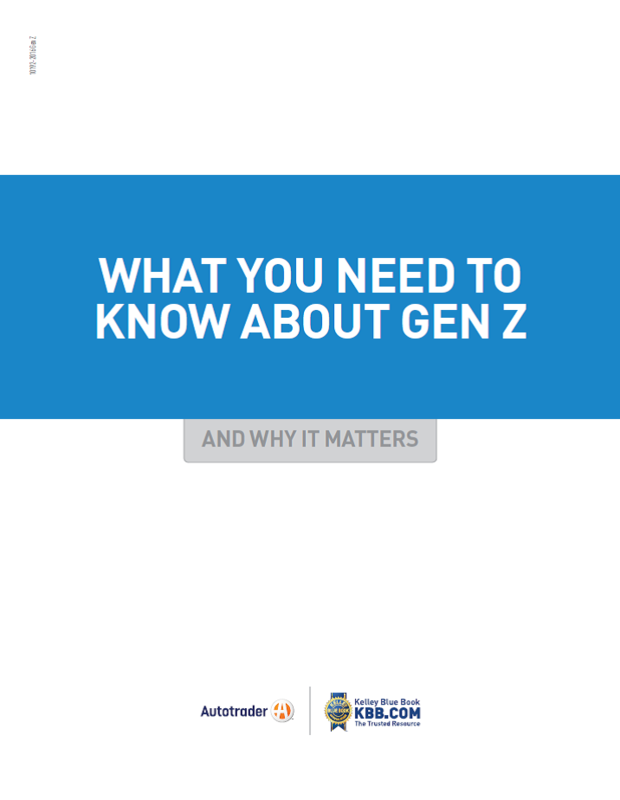 See the full study to learn what you need to know about Gen Z and why it matters.